Pennsylvania Avenue's other famous couple. It is 12:30 on a Thursday afternoon and it is hot, one of those searing, humid days that remind Washingtonians they live in the U.S. South. In front of the White House, tourists are undeterred. They come in groups large and small, stopping to take pictures of the president's home or to peer through the wrought iron bars that keep them from it. Across the street, on the edge of Lafayette Park, Concepcion Picciotto is protesting loudly. "That man is crazy!" she cries, in a high-pitched, heavily-accented voice, pointing to the White House. "Destroy the people! Destroy the nation! No future for the children!" Picciotto is by no means a threatening protester. She is about five feet tall. Her skin is darkly tanned and heavily creased. She is missing teeth. She wears a dark brown wig over a cap, covered by a purple and beige scarf. On this day, she is wearing a peach-coloured blouse, white cotton pajama-style pants with pale yellow flowers, and brown sandals. She also wears a large, forest green fanny pack and has a set of keys around her neck. Don't underestimate her, though. 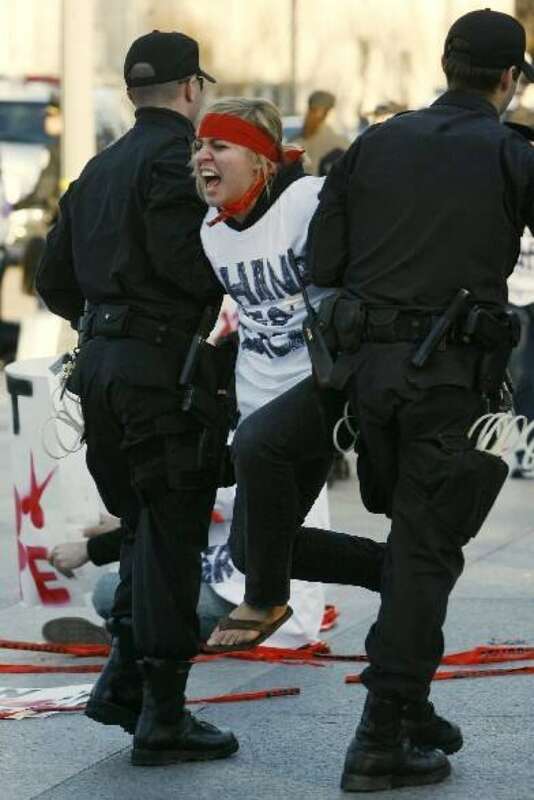 Picciotto is one of Washington's best-known protesters. 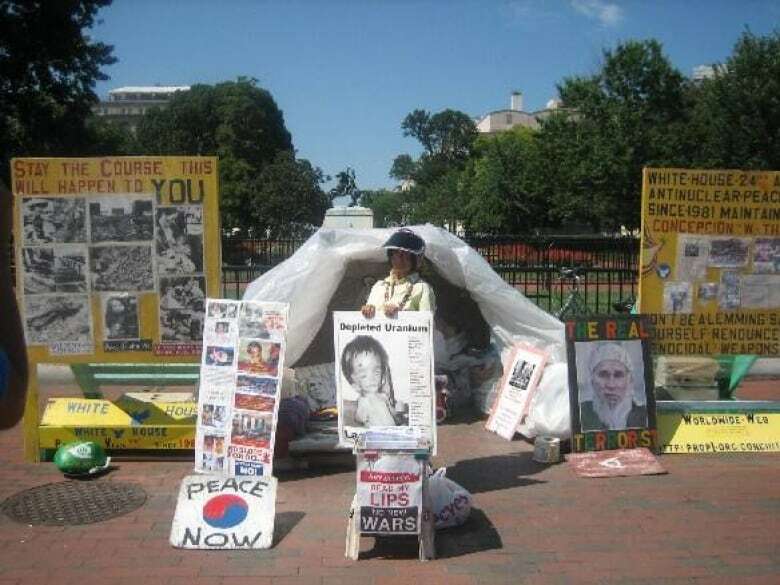 She and a partner, William Thomas, have lived in a makeshift tent across the street from the White House since 1981. Thomas was there first. In June 1981, deeply disenchanted with the role of the United States in the world, he went to the White House and sat down on the sidewalk in front of it with a sign reading "Wanted: Wisdom and Honesty." Later, Picciotto, herself disenchanted, joined him. They protested by day and slept in Lafayette Park by night. But that didn't sit well with the National Park Service. It set limits on how many signs a person could have and banned camping. That means Thomas and Picciotto can't sleep there, so they take six-hour shifts, shuttling between their camp and a homeless shelter nearby. The camp is an anti-White House, of sorts. Their shelter is a large patio umbrella propped on its side and covered in heavy plastic. A wooden pallet covered in a sheepskin rug and brown and beige striped blanket is a makeshift bed. There is a milk crate, too, for sitting on, and a cooler. Signs are the main focus. They say things like "Live by the Bomb, Die by the Bomb," "Ban All Nuclear Weapons or Have a Nice Doomsday," "Don't Be a Lemming. Save Yourself" and "Peace Now." Laminated posters show children who died during the Second World War bombing of Hiroshima or deformed by chemical warfare. There is also a large picture of President George W. Bush with a long white beard and wearing a turban — the kind Osama bin Laden might wear — that says "The Real Terrorist." "That man is crazy!" Picciotto cries again in a high-pitched voice, pointing at the White House. She has a heavy Spanish accent. "Destroy the people! Destroy the nation!" A group of teenagers amble up to the vigil. "What are you saying?" asks a boy wearing a navy blue shirt and jeans. "No future for the children!" the tiny Picciotto cries. "Looks pretty good to me," the boy says, snidely. "How long have you been here?" Picciotto points to a sign behind her. "That's a long time!" the boy says. "They listening to you?" "You are," Picciotto says. "It's your future, not mine." "I got a good future," the boy answers, laughing. "I don't want to sit on the side of the road for the rest of my life." He shakes his head. "What a waste of a life," he says, and he and his friends walk away. Picciotto does not react. She turns and straightens some of her signs. Then she takes her fanny pack off. She takes a can of juice out of the cooler, opens it, turns back around and takes a sip. A couple — tall, blond and Scandinavian-looking — stop to read the signs. As they walk away, the woman smiles and gives Picciotto a thumbs up. Picciotto is hot. She rummages in her plastic bag and takes out a yellow, red and purple straw fan and waves it gently in front of her face. She takes out a parasol, too. It is white with blue stripes. Two dozen or so tourists pose for a group photo in front of the White House. They are dressed in business suits and look like they come from East Asia. Picciotto goes to her tent and brings out a rectangular sign with four Chinese symbols on it. She holds it up in the air so the tourists can see it. A young man in jeans and a striped golf shirt asks Picciotto what it says. The tourists walk away. Picciotto puts her sign back. A woman in jeans and a grey tank top stops to look at Picciotto and her posters. "Do you mind if I take your picture?" she asks. Picciotto does not. The woman takes a picture. An older woman walks up to a yellow mustard container with a hole in its lid that sits next to the cooler and puts some money in it. "I like that," says the younger woman, pointing at the poster of Bush. She and the older woman take some flyers that Picciotto has put out and walk away together. Another young woman approaches. She asks Picciotto whether she ever gets tired of holding vigil. "I get tired of people who do not think," Picciotto answers. "The people, they come, they take the pictures, and they leave. They don't think. This is about their future. It is not my future. It is the future of the children."